Here are the 7 co-champions. From L to R: Jacob Chudnovsky, James Wheat, Morgan Pehme, Nawrose Nur, Me, Greg Shahade, and Jonathan Goldfarb. Here I am holding the championship trophy. I dedicated this tournament to the memory of Kevin Satin. 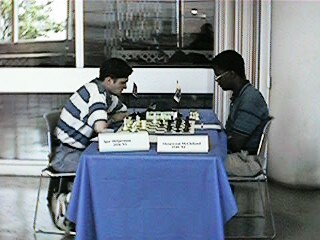 National 11th and 12th Grade Chess Championships. Bobby Fischer won this tournament! event for chess players under 20 years old. I finished 7th.